You walk into a store in search of new sunglasses. As you enter, your smartphone pings, and you open it to find a map, showing you where the sunglasses you looked at online are on display in-store. You walk over to them, try them on, and put them in your bag. A robot rolls up to you and intercepts, asking if you need help finding anything else. The robot takes you to a jeans display, as you’ve requested, and finds your size. When you’re done shopping, you leave the store immediately. Your items are scanned by sensors as you leave and added up — the final price is then deduced from your mobile payment app. Since you’ve shopped there recently, you receive an automatic discount. The shelf where you picked up the jeans, meanwhile, takes note of the purchase and sends that information to a back-end inventory system, so the retail store’s manager knows to re-stock. Sound a little too much like Smart House? Maybe, but this experience is closer than you think, thanks to the rise of IoT, or Internet of Things, which creates a network between internet-connected physical devices. In the next few years, physical devices capable of being connected to the internet will continue to rise — in fact, by 2020, it’s estimated there will be over 30 billion IoT devices. The scenario above is explained from a customer’s perspective, but it’s important to take note of just how deeply IoT can affect retail store owners and employees. McKinsey estimates that the potential economic impact of IoT in retail environments will range from $410 billion to $1.2 trillion per year by 2025. IoT can reduce inventory error, optimize your supply chain management, and decrease labor costs. Ultimately, IoT can help your traditional brick-and-mortar shop compete with today’s online-first shopping world, by exponentially improving customer experience and decreasing unnecessary expenses. There are numerous IoT-related benefits to the retail industry, but here, we’ll hone in on the seven most important ways we think IoT will change retail in 2018. You’ve probably seen how long lines deter your customers from purchasing products. And, as a manager, it can feel unprofitable to pay multiple employees to work during busier shopping times. With IoT, you can set up a system to read tags on each item when a customer leaves the store. A checkout system would then tally the items up and automatically deduce that cost from the customers’ mobile payment app. Creating an automated checkout system using IoT devices would make your customers happier and more willing to enter your store, especially if they are on a time crunch. 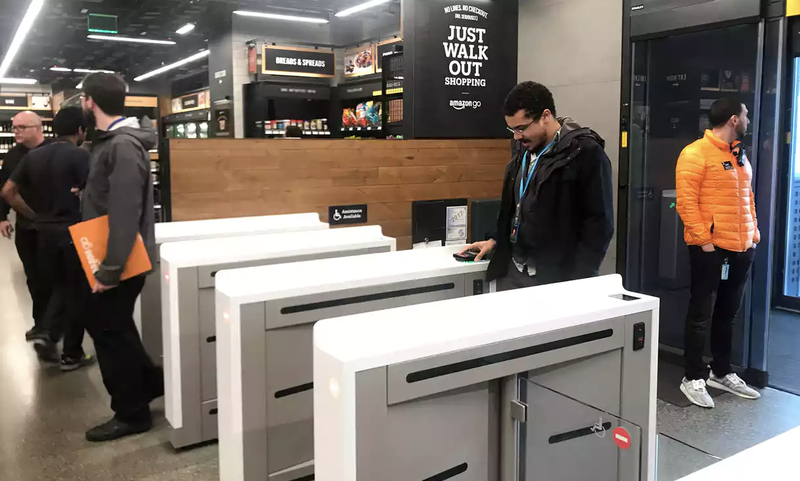 It can also save you a ton of money — McKinsey estimates automated checkout can reduce cashier staff requirements by up to 75%, resulting in savings of $150 billion to $380 billion a year in 2025. If you have frequently returning customers, I bet you’d like to reward them for their loyalty. With IoT, you can set up sensors around the store that send loyalty discounts to certain customers when they stand near products with their smartphones, if those customers sign up for a loyalty program in advance. Additionally, you can use IoT to track items a customer has been looking at online, and send that customer a personalized discount when she’s in-store. Imagine if your customer perused your purses online, and then, in-store, received a discount on her favorite purse? Rather than offering general discounts on a wide variety of products, you can tailor each discount using IoT to maximize your conversion rates. Ultimately, finding ways to incorporate IoT devices into your day-to-day business requires creativity and foresight, but the benefits of IoT in retail — as outlined above — can help your business discover innovative solutions to attract more valuable and loyal long-term customers. Beacons, first introduced by Apple in 2013, are small Bluetooth devices that send alerts to smartphones based on location proximity. In the retail industry, this means customers can receive discounts, special events, or other reminders when they’re near a shop and have previously downloaded the store’s app. Macy’s has been using beacons nationwide since 2014. After opening the Macy’s app in-store, shoppers are alerted to promotions and discounts. The app also recognizes which area of the store you’re in — so if you’ve entered the makeup section, the app will remind you of the makeup brands you liked online. Along with helping customers in-store, beacons also send alerts to passersby. This can be used to effectively advertise promotions or in-store events. Swirl Networks Inc. found over 70% of shoppers say beacon-triggered content and offers increased their likelihood to purchase in-store. Besides Macy’s, stores including Urban Outfitters, CVS, Lord & Taylor, and Timberland already use beacon technology. A lot of your employees’ time and energy is focused on keeping track of items to ensure they’re never out-of-stock, and checking that items aren’t misplaced on various shelves. You can use Smart Shelves to automate both of those tasks, while simultaneously detecting potential theft. Smart shelves are fitted with weight sensors and use RFID tags and readers to scan the products on both display and stock shelves. Smart Shelves inform you when items are running low or when items are incorrectly placed on a shelf, which makes your inventory process cost-effective and more precise. Additionally, each RFID tag is connected to a reader, so Smart Shelves are able to detect in-store theft — saving you money on security personnel and cameras. You might be surprised to find your retail space isn’t optimized for your customers’ behavior — maybe your least popular products are in the front, or your customers’ would prefer more space around the couches in the back. By employing aisle-analytics software with infrared sensors, you can use IoT technology to improve your retail layout. Perhaps you find most of your customers spend the majority of their time checking out your TV’s — but those TV’s are placed in the back of the store, behind rarely-touched DVD players. This information arms you with important customer behavior knowledge, so you can place items they care about most, like TV’s, in the front of your store. While it’s a little frightening to trust a robot to be your customer service representative, it’s also a fantastic opportunity to cut down on menial tasks burdening your workforce. OSHbot, Lowe’s newest robot employee, helps customers find specific products and provides information on promotions and inventory — plus, he’s (she’s?) bilingual and can answer both English and Spanish questions. Other retail stores, such as Target, use robots to roam the store and take note of misplaced items, or products running out of stock. By taking over simple inventory tasks, Target’s robot frees up Target’s human employees to focus on providing top-notch customer assistance. While retail stores can already track products without the help of IoT, that tracking information is pretty limited. With RFID and GPS sensors, you can use IoT to obtain more precise data, like the temperature at which an item is being stored, or how long it spent in transit. You can use that data to improve the quality of transportation moving forward — and, better yet, you can also act in real-time if a product is being kept at temperatures too low or too high, avoiding a substantial loss. According to a TATA Consultancy Survey and Business Insider, manufacturers utilizing IoT solutions in 2014 saw an average 28.5% increase in revenues between 2013 and 2014. If you’ve got a long line of suppliers, truck drivers, and vendors handling your products, it’s imperative for you to accurately keep track of how your product is handled and where it’s located in the supply chain. This information helps you ensure your process is running as efficiently as possible, and can help you get your product into your customers’ hands faster.